Cleaning your blinds is incredibly important. If left unkempt, blinds can collect all sorts of dust, dirt, and buildup that can irritate allergies, cause sickness, and make your overall health deteriorate. Blind cleaning is a household chore that is often overlooked, and even more often dreaded. This task can be incredibly cumbersome, and often feels unnecessary in the grand scheme of things. As you can see, the need to clean your blinds outweighs the chore that it tends to be. But what if it didn’t have to be as hefty a duty as it may seem? While it may seem bizarre, using a vacuum cleaner on your blinds can actually be a huge time saver. This is not to say that you should be lifting up your entire vacuum cleaner and holding it up to your windows. But if you have a vacuum with a hose attachment, then you might be in luck. 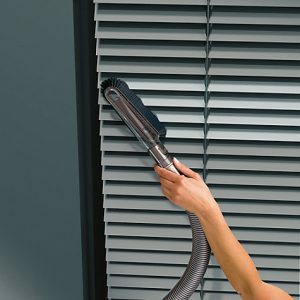 Using the hose attachment of your vacuum, clean the blinds as gently as you can. It is important to move the vacuum hose in the correct direction so as not to damage your blinds. If you have horizontal blinds, then you will want to move the vacuum horizontally along the slats. This will ensure that you are removing all the dust, as well as preventing your blinds from the potential damage that a vacuum cleaner can inflict upon them. Vertical blinds will need to be vacuumed vertically along the slats for the same reasons. Blinds that are vacuumed in the wrong direction run the risk of becoming unhooked, knocked out of place, or broken. Also known as a dry sponge, a rubber sponge is an incredibly sturdy variety of a sponge that is great for picking up dust and residue. A rubber sponge can be found at practically any hardware store, and is a great addition to the home for multiple uses. When it comes to using a rubber sponge with blinds, the technique is simple. Run the rubber sponge firmly across each side of the blind, removing debris from the sponge as necessary. The capacity of the rubber sponge to pick up debris instead of wipe it away makes the process of cleaning with it faster than that of a regular sponge. Plus, the rubber sponge does not require any soap and water, which can save your blinds in the long run. Cleaning your blinds does not have to be as cumbersome a task as it may seem. However, sometimes your blinds get dirty beyond the point of cleaning. When this is the case, turn to Mayfair Paint N Paper Ltd. for a brand-new set of blinds for a reasonable price.